Sounds precisely like the true version of Kim Stanley Robinson's Khembalung in "Forty Signs of Rain": A small island off coast of India that is slowly being flooded by rising tides. Wish I could provide more than that but I read it along time ago and haven't read the other two parts yet. Maybe Mr Manaugh could provide the rest of the story. Looks like a straight ripoff of PLOT. Looks like it's sponsored by Mercedes-Benz. Just look at some of the windows. 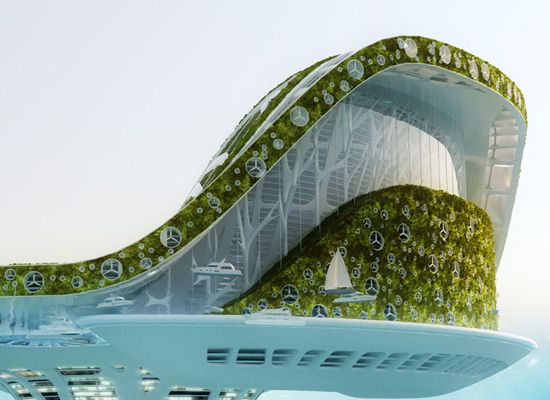 Speaking of climate-inspired lilypads, have you seen the proposal for solar lilypads in Glasgow's River Clyde? I think the Benz windows are supposed to be wind turbines. But it's interesting to think about the similarities between the gestures of wearing a hood ornament around your neck, and photoshopping windmills or solar panels into your architectural renderings. Sorry Pixelab. Image info has been corrected. And thanks Peter and Pixel! Too bad global warming alarmism is grossly overblown and rooted in awful science and political expediency. Those are some pretty sweet pseudo-islands though. “Too bad global warming alarmism is grossly overblown..."
"and rooted in awful science..."
I think we all are on the same boat as the Kiribati. We all are not too far away from future turmoil and devastation. 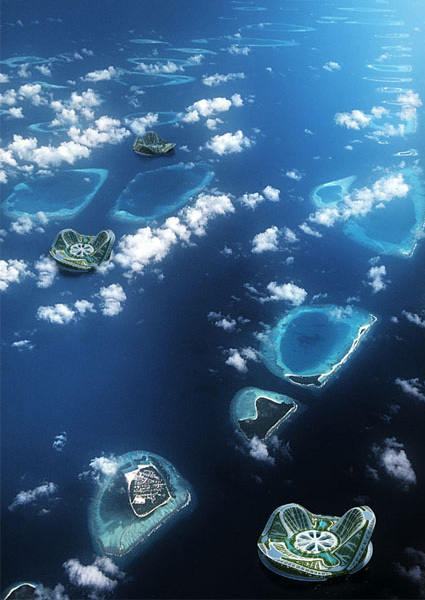 Even if global warming didn't happen, islands like these would still be handy. Fish farming, mobile military bases, energy and mineral production all come to mind. The forms are interesting,and the renderings are great, but what is the life of the inhabitants like in this place? People seem to be only sprinkles on the megastructure cake. I wonder about waking up to the same boring view every morning. It would be nice every once in a while like for a vacation. But if I were a Kiribatian I would not want my president to opt for these psudo-islands for our homeland. It's too regular. I'm wondering if it could be made to look more natural? And what about fauna? We need our animal friends to complete any ecosystem. there are no animals worth mentioning on kiribati, apart from birds and fishes. the main land-dwelling animals on the islands are pigs, rats, and stray dogs. otoh, these 'animal friends' would certainly be more than willing to live in such structures. apart from that, these designs are probably more adequate for those multi-millionaires who can afford a helicopter lift to their appartment, as i don't see any space for aeroplane runways or harbour basins. implementing this idea in a country like kiribati is roughly as realistic as property development in the slums of lagos, or gentrification in magnitogorsk. Which idea? There are several proposals in the post. 3) New Kiribati v1.0, or: Lilypad as is? 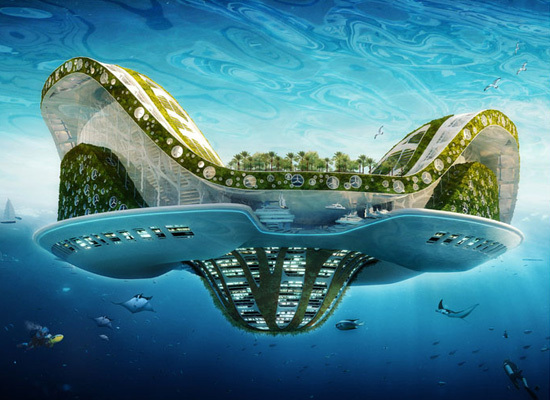 4) New Kiribati v2.0, or: Lilypad less pimped out? 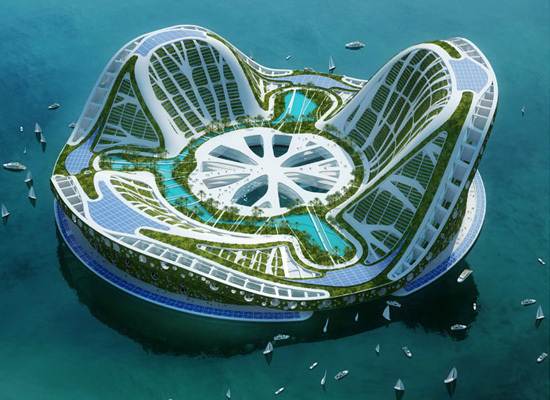 5) Floating Hotel & Duty Free Mall, or: Kiribatians as stateless migrant employees of oceanic Las Vegases? i'd probably take no.5, and replace the lilypad by any kind of cruise liner. foreign shipping agencies nowadays employ roughly one quarter of the i-kiribati workforce, thus already being the second largest employer after the government. i don't see the i-kiribati becoming stateless either, they will probably end up in some council housing scheme in brisbane, or as taiwanese or PRC citizens. there will be many countries on the pacific rim which would willingly trade the responsibility for ~100 000 extra citizens for fishing grounds the size of india. With all due respect, please keep in mind that we are talking about real people here. This is not some technological thriller/fantasy. And these people had the techological prowess and courage to sail across the Pacific, long before GPS and contemporary navigation systems, with their children, their animals, and their seedlings, to make a new home in the islands of Kiribati. Anyone whose ancestors made the move across the Pacific and found tiny atolls to set up shack on is probably already brainstorming ideas on how to survive a significant rise in sea level, and I hope we can do our best to support their efforts and our own by actively keeping our common homeland cleaner and more liveable. This type of story needs to be publicized in many other places to support the efforts of the idea and country. We are talking about REAL people and as a kiribati girl it's hurtful to think that the world thinks of us a lab rats for impractical ideas when we need a real solution and we need one now. I've seen this project quite a bit over the past couple years but never knew anything about its proposed application. 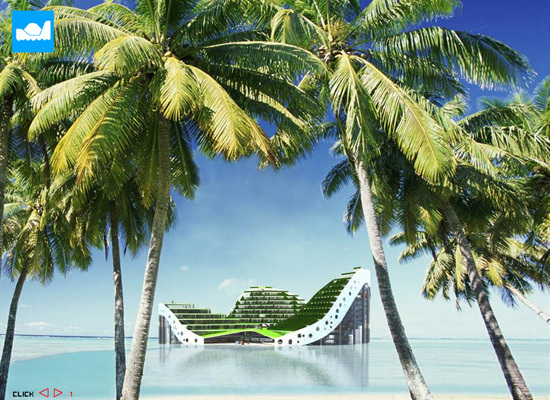 I thinks its a beautiful proposal but I seriously agree with you comment "Kiribati would probably need a less pimped out version". It would be interesting to develop a prototype which functions solely as a tourist destination that could eventually fund the construction of future units for refugees. Still, this seems improbable, but interesting nevertheless. On the other hand, Its pristine qualities bother me. Everyone, including myself, loves to see beautiful renderings. But, it would be really great to imaging the effects of the ocean and climate, increasing population, and growth of vegetation upon a floating vessel such as this. 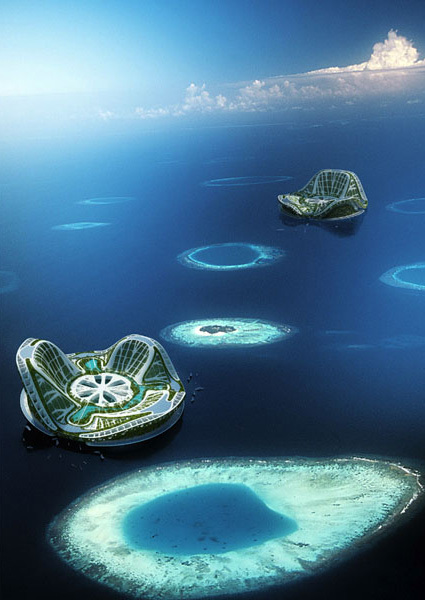 The Lilypads are beautiful, but unviable; Where would they be built? The solution to Kiribati would be easier with the Mega-Float (http://www.srcj.or.jp/html/megafloat_en/index.html), that can be built in any shipyard, is already tested and approved, and is modular, allowing to Kiribatians decide their island's size. This is way cool. I'd really love to see Kiribati in a more developed and modernized society. Yet I wonder of what effects there would be in growing tress and other life form on this floating vessel. The ecosystem has its own balance into it. I wonder what kind of ecosystem there would be in having relocating soil and other life form onto a ship! The whole idea sounds possible, just like the creation of motors to replace horses and wind to power transportation and other manual labor, yet we are now living in the consequence of that action, our great concern right now is fighting Global Warming and saving our rising generations. This project is beautiful way cool. Yet I am so curious of the new impact this will have on the people and natural environment of Kiribati. Its a beautiful idea indeed; ideas always leads to an action, and taking an action on an idea leads to a consequence, I wounder what lies there? you have all drank the kool aid.